Motionpost is a video production company that produces marketing videos, corporate videos, special event videos, podcasts, commercials, and more for businesses and nonprofit organizations. Their staff includes video editors, directors, producers, videographers, and graphic artists that handle every step of the video production process from shooting and directing to video editing and motion graphics. 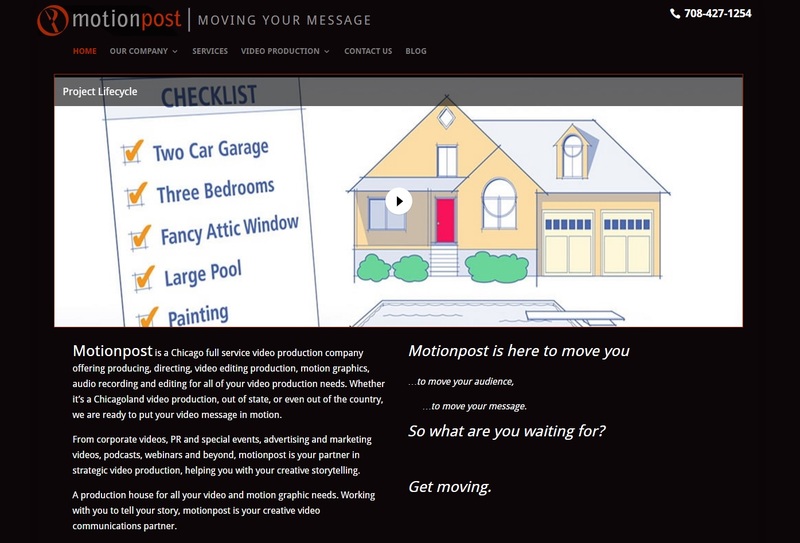 Motionpost has worked with many Chicago area companies and nonprofits to create videos for marketing and promotional purposes and their work has won several awards including a Telly Award and the Slamdance Special Jury Award for Documentary Feature. Their talented staff is committed to helping put your message to video. Motionpost’s previous website was developed years ago and the design was outdated with the current digital marketing and mobile trends. The client – a Chicago based video production company – needed a modern responsive website and better SEO results and came to Proceed Innovative for SEO and web design services. Our web design experts developed a whole new design and navigation structure that improved the usability, SEO performance, and mobile responsiveness of the website. The navigation now includes easy to use drop down menus that allow users to quickly find any page of their website and the responsive design and embedded videos display and play properly across all mobile devices. It is very important for a website that includes embedded videos to display properly on mobile devices because most online video consumption is done by mobile users. As the new website was built, we also optimized each page to perform better in the search engine rankings and attract more organic search traffic.